Kulpreet is a Senior Executive with over 20 years of experience in Business Process Outsourcing (BPO), Business Transformation & Digital. 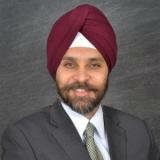 With substantial experience in building robust businesses as a Senior Executive in BPO, Analytics & Robotic Process Automation sectors, Kulpreet now leads UiPath growth efforts as Managing Director EMEA and APAC. Check out the incredible speaker line-up to see who will be joining Kulpreet.